On Saturday, October 19th, ARC of Oswego County presented “Hog Wild Jam”. With more than 125 guests in attendance, they dined on roast pork, corn on the cob, salt potatoes, macaroni salad, hot dogs, and an assortment of desserts. In addition, live entertainment was provided throughout the day and over 25 silent auction items were raffled off. Thanks to the following sponsors, the event was a success. 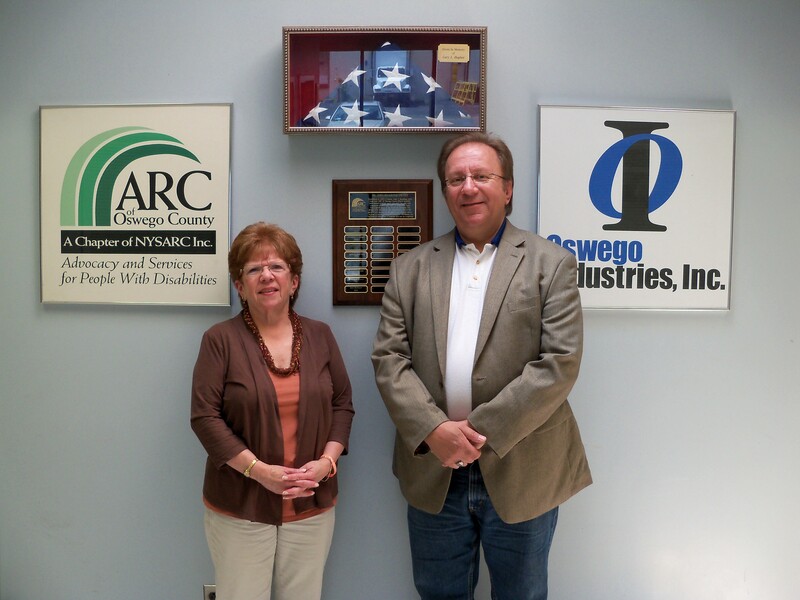 ARC of Oswego County appreciates their support! Ulys, Sysco, C’s Farm, Cam’s Pizza, Pizza Hut, Kinney Drugs, Burger King, Price Chopper, Boscos, McDonalds, Arby’s, Burger King, Foursome Diner, Domino’s Pizza, Wendy’s, Kathy’s Family Diner, Steamers, Locos, Greens Tavern, Ruby Tuesdays, Mr. Mikes, Jimmie James, Eagle Beverage, DeVito & Lopez, DDS, YMCA of Fulton, Family Video, Dinosaur BBQ, Funny Bones, Dunkin Donuts, A&P Auto, Fred Raynor, J. Robinson, JP Jewelers, Video Paradise, DNS Landscaping, All Seasons Inn, Beacon Hotel, Quality Inn, Riverview Wellness, Going to the Dogs, White Dog Bakery, Fulton TV and Applicance, Kathy’s Cakes, Cakes Galore, Kitty’s Creations, and SUNY Oswego. ARC of Oswego would also like to thank the following entertainers for donating their time to support our cause: John McConnell, Bob Garafolo, Mark Whal, Mike Shell, and Harry Shorts Band. Kerri Porter, Teresa Gilbert, Pat Evans, Amanda Hastings, Kristen DeSantis, Rich Coots, Marc Warner, Cindy Hesselbarth, Jim LaRock, Bob Spinelli, Judy Bonanni, Scott McHenry, Dale Rima. 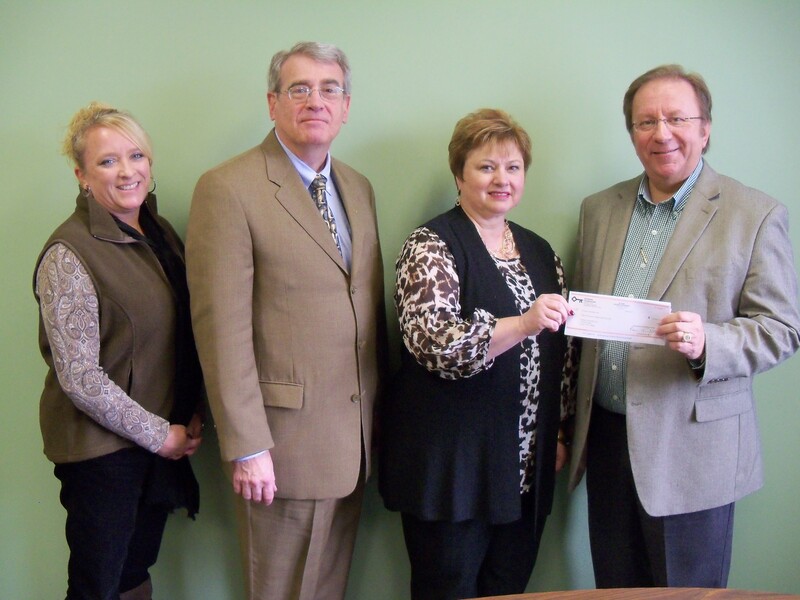 KeyBank Foundation recently awarded Oswego Industries with a check to support its’ Workforce Development Program. 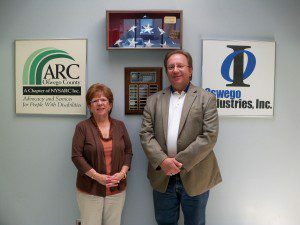 “Oswego Industries Work Readiness Program for Intellectual and Developmental Disabled Individuals”, will provide adult disabled individuals with the essential skills to enhance their ability to obtain employment in the food service environment so that they may transition into meaningful employment through hands-on work experience. Oswego Industries thanks KeyBank for their support. Picture left to right: Laurie Davis, Director of Finance; Steven Pierce, KeyBank – Senior Vice President Relationship Manager; Gina Carmardello, KeyBank – Fulton Branch Manager; and Mike Szpak, CEO Oswego Industries. ARC of Oswego County is hosting a free family concert on Friday evening, September 20th, from 5:00 p.m. – 7:00 p.m. at the West Linear Park in Oswego. 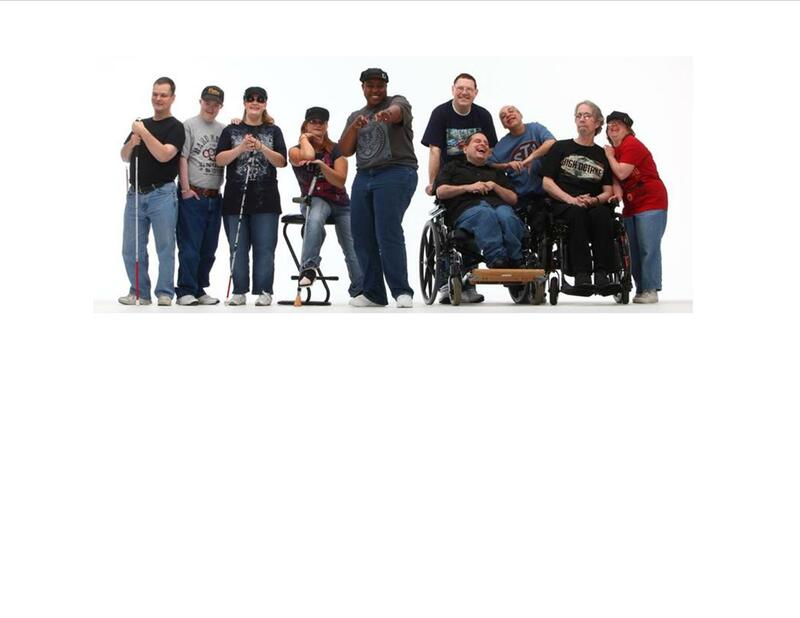 ARC of Oswego County will provide a free family concert featuring the group, FLAME, a group of talented musicians from upstate New York who happen to have disabilities. FLAME has captured the world’s attention performing throughout the United States and in Europe. The band performs for national and statewide conventions, corporate conferences, civic events, schools, dances, and private parties. FLAME’s song list contains over 100 classic hits – rock, country, and blues – from the past five decades. Food and beverages will be available. For more information, please contact 598-3108. Please join Oswego Industries Golf Committee (CEO Mike Szpak, Cheri Haskins, Kerri Porter, Kelly Wells, Larry Steinburg, Amy Strong, Shirley Baker, and Theresa Gilbert) on Saturday August 10th for their 8th Annual Golf Open at Battle Island Golf Course, in Fulton, NY. Registration fees ($60) includes 18 holes of golf with use of a cart, refreshments, annual gift, tee prizes, and more. Winner(s) of the hole in one will receive a $500 gift certificate from Price Chopper. Dinner will consist of barbecue chicken, pulled pork, salt potatoes, corn on the cob, tossed salad, and dessert. Registration begins at 12:30 p.m. For more information, please call (315) 598-3108, ext. 227. 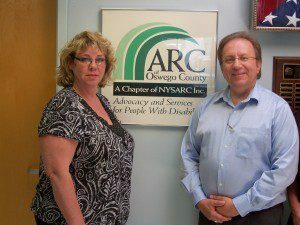 ARC of Oswego County would like to acknowledge and thank Dale Rima for going above and beyond. Our 2013 Membership Campaign is well underway and Dale is responsible for bringing in just under $1,000 in donations. It’s members like Dale that inspire us all to support such a worthwhile cause.